Here is a brief list of some of the better-known ski and winter sports retail stores around North America. If you know of a good shop that isn't on our list, please visit our contact page. Thanks. Al's Ski Equipment Barn - Freeport, Maine. Aspen East Ski Shop - Killington, Vermont. Basin Ski Shop - Killington, Vermont. Buckman's Ski Shops - Stores in Bryn Mawr, King of Prussia, Doylestown, Montgomeryville and Reading, Pennsylvania. Colorado Ski Shop, Inc.- West Springfield, Massachusetts. First Trax- Montgomery Center, Vermont. Golf & Ski Warehouse - Stores in West Lebanon, Hudson and Greenland, New Hampshire. Joe Jones Ski & Sports - Stores in North Conway, Intervale, Waterville Valley and Campton New Hampshire; South Portland, Waterville and Winthrop, Maine; Rutland and West Dover, Vermont. Langhorne Ski & Sport - Langhorne, Pennsylvania. McCauley Mountain Ski Shop - Inlet, New York. Northern Ski Works - Stores in Killington and Ludlow, Vermont. Northwoods Outfitters - Greenville, Maine. Pelican Ski Shop - Morris Plains, New Jersey. Plaine's Bike Ski Snowboard - Pittsfield, Massachusetts. Princeton Ski Shops - Shops in Manhattan, Roslyn and Elmsford, New York; and Clifton, New Jersey. Salter's Ski Shop - Eagleville, Pennsylvania. Scandinavian Ski & Sport Shop - Manhattan, New York. Mount Kato Ski Shop - Mankato, Minnesota. Vertical Drop -St. Charles, Illinois. Bromley Mountain Ski Shop - Bromley, Montana. Ski Center - Washington, DC. Ski Chalet - Shops in Arlington, Chantilly and Tysons Corner, Virginia; Gaithersburg, Maryland; and Richmond, Virginia. Southern Ski - Columbia, South Carolina. St. Bernard Sports - Dallas, Texas. American Ski Exchange - Vail Village, Colorado. Carvers Ski-Board-Sport - Brekenridge, Colorado. Christy Sports - Stores in Colorado Springs, Boulder, Denver, Snow Bird, Deer Valley, Snowmass, Crested Butte, Winter Park, Vail, Steamboat Springs, Keystone, Copper Mountain, Breckenridge, Dillon, Frisco and Telluride, Colorado. FootlooseSports Ski Shop - Mammoth Lakes, California. H & H Jobbing Company - Stores in Los Angeles and Redondo Beach, California. Kenny's Double Diamond Ski Shop - Vail, Colorado. Pomeroy Sports - Aspen, Colorado. Tahoe Dave's Skis & Boards - Four Tahoe locations. TelemarkSki.com - Crested Butte, Colorado. Mount Kirby Skis and Boards - Stores in Oshawa, Kirby, Unionville and Ashburn, Ontario. SnowCovers - Stores in Vancouver and Whistler, British Columbia. 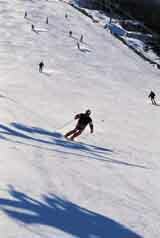 Summit Ski and Snowboard - Whistler, British Columbia. Oberson Sports - Laval, Quebec. We can't ski all day, every day, we have to work once in a while. But when you have to get back to work, make sure you actually like your job. If you don't like your job, you can always get trained for a job you will like. A site like http://www.managementtrainingclasses.com can help a hard-working individual move up the company ladder.